Except for the “envelope” component, energy use is tracked on a BTU basis and is modified by various policies, such as efficiency standards, accelerated retrofitting, and component electrification (similar to vehicle electrification in the Transportation sector). Envelope is handled as a multiplier that affects the energy use of the “heating” and “cooling and ventilation” components. In the BAU case, this multiplier is 1. It can be improved via policies, in the same ways in which policies can reduce the energy use of energy-using components. After this process, the envelope number is multiplied by the “heating” and “cooling and ventilation” energy use figures to reduce their energy use, if there were any envelope improvements. Thus, improvements for “heating” and “cooling and ventilation” components in this model refer specifically to the mechanical systems providing these services, and improvements resulting from improved insulation, windows, doors, etc. are handled via the envelope component. Users should keep this in mind when setting policy levers for each component type. Note that water heaters, which are categorized as part of a building’s “heating” systems in some data sources, are treated as part of the “appliances” component category in this model because water heater energy use should not be affected by building envelope. In each year, the new components’ energy use is calculated by starting with total components’ energy use, subtracting last year’s components’ energy use, and adding the energy use of components that retired. Retiring components’ energy use is calculated differently depending on whether a number of model years have elapsed that is greater than the lifetime of a given component type. For example, appliances have a lifetime of 14 years in this model. In each of the first 14 years of the model run, one fourteenth of the total energy use from appliances that existed in the model’s start year is retired. This assumes a linear distribution of component ages between zero and the component lifetime at the moment the model starts, and it assumes that efficiency of these components is roughly constant. In reality, fewer components will exist near the higher end of the age range, but these will also tend to be less efficient than average, so these assumptions may compensate for one-another, and assuming an equal amount of energy use retiring each year between model start and the component lifetime may be reasonable. After the model has run a number of years equal to the component lifetime, we no longer need to rely on an assumed linear age distribution of energy use because the model itself calculated the New Components Energy Use for that component type one lifetime ago. The component energy use it added to the model at that time is retired after one lifetime. For example, after the model has run for 14 years, it will retire the energy use of the appliances that were added to the model in the first year. This energy is added “upstream” of the effects of the other policies that reduce or affect energy use (such as improved efficiency standards, etc.) 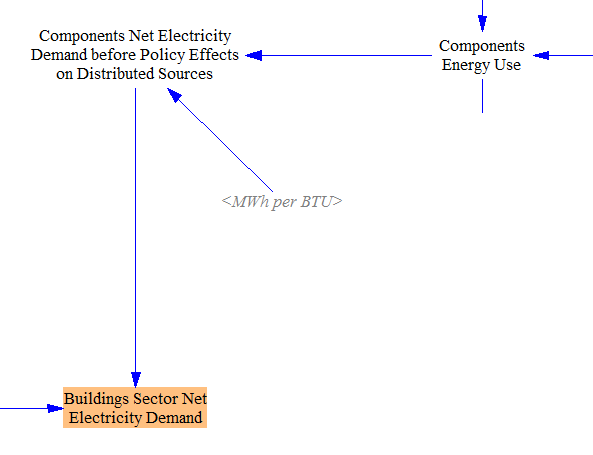 so that those policies can affect not only the BAU new components’ energy use, but also the energy use of new components purchased as a result of the accelerated retrofitting policy. At the time when the components replaced by the early retrofitting policy would naturally have retired anyway, the BAU New Components data assumes replacements will be purchased, but it is not necessary, as they were replaced already. 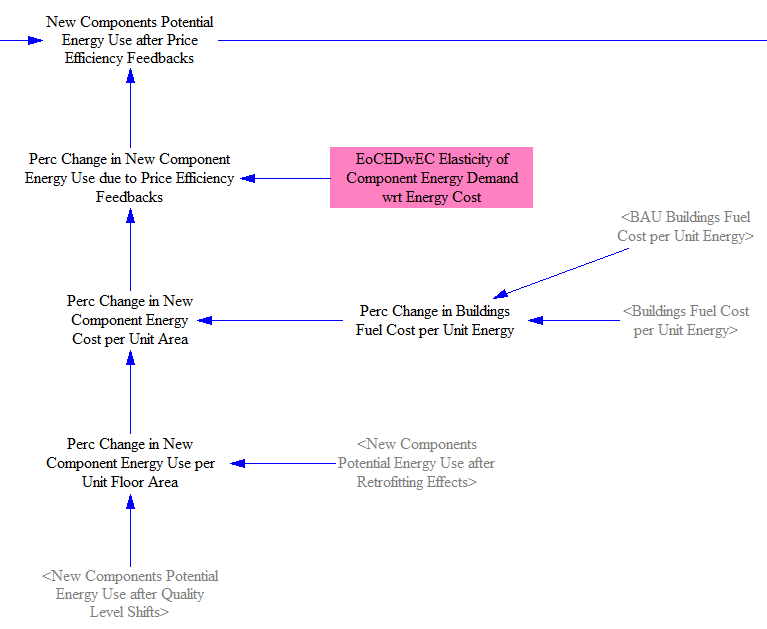 Therefore, we have to subtract the potential energy use of the components purchased due to the retrofitting policy at the time when the replaced component would have retired. 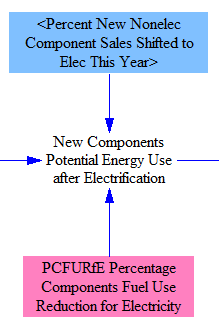 The difference is in the “Net Potential Energy Use of New Components Caused by Retrofitting Policy” variable, which is added to “BAU New Components Energy Use” to find the total potential energy use of new components after retrofitting effects in each model year, as shown in the following screenshot. We also track the cumulative potential energy use of components that have been replaced due to the retrofitting policy (in “Replaced Components Potential Energy Use”). 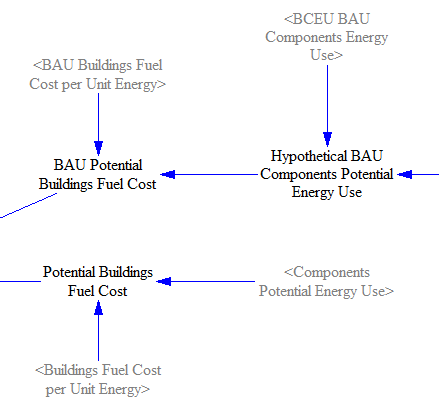 This contains the energy use of the components that exist in the BAU case but no longer exist in the policy case because of retrofitting. (Again, we subtract out the energy use at the time the components would have been replaced in the BAU case.) 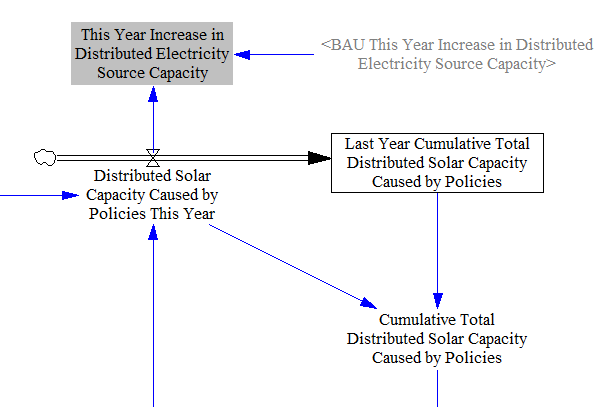 This potential energy use has to be subtracted from the potential energy use in the BAU case plus the cumulative difference due to our policies because these components do not exist in the current model year in the policy case, but they haven’t yet retired out of the BAU input dataset. Vensim doesn’t update level variables with the current year’s inflows and outflows- the current year’s flows affect the level variable next year. We want to adhere to the user-defined policy implementation schedule without introducing a one-year delay. (If the user wanted a one-year delay, he/she would have put it into the policy implementation schedule.) Accordingly, we manually add the current year’s inflows and outflows to the cumulative total to obtain the “Cumulative Replaced Components Potential Energy Use” (and later in the Buildings Sector, the “Cumulative Potential Energy Difference Relative to BAU”). We do something similar with all other level variables in the Energy Policy Simulator (EPS). The implementation of these policies is straightforward, as the user settings of these policy levers explicitly define their effects. We conservatively assume that newly sold building components just meet the reduction in energy use required by the standard. The R&D policies are defined to be additional R&D beyond any that may be needed to satisfy requirements of other policies, such as R&D by building component manufacturers done in order to meet efficiency standards. 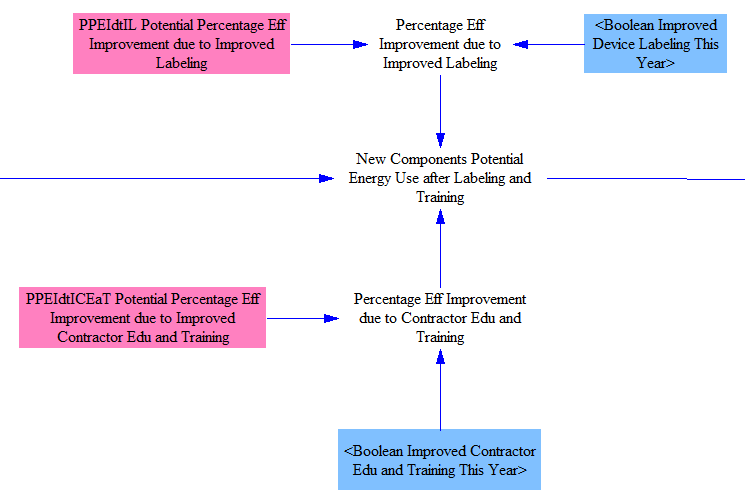 The following structure implements two Boolean policies (i.e., policies that can only be set to “on” or “off” rather than set to a range of different values): improved device labeling and improved contractor education and training. Energy efficiency labeling reduces the energy use of specific types of devices- appliances, heating equipment (i.e. central air furnace), and cooling / ventilation equipment (e.g. air conditioning units). Contractor education and training improves the performance of building envelope components, reducing energy spent on heating and cooling. In both cases, these are Boolean policies because specific labeling interventions and specific training programs were studied in our input data sources- it does not make sense to allow a user to implement a fraction of a labeling program or a fraction of a training program. The rebate program is a Boolean lever because only rebates of particular magnitudes have been studied in the literature. Typical rebate values represented by this lever are $50-100 for a clothes washer and $25-50 for a dishwasher or refrigerator. 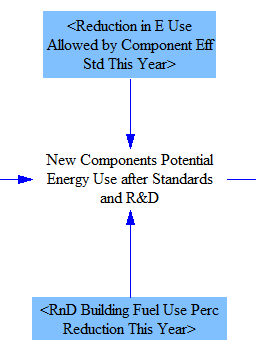 The energy use of new components (including BAU new components and new components added due to retrofitting) is compared with the energy use of that same set of components after application of those policies that reduce the energy use of new components (such as efficiency standards, contractor training, etc.) to determine the “Perc Change in New Component Energy Use per Unit Floor Area.” We don’t actually work in terms of floor area- this term is simply a way to express the fact that the components being compared provide services to the same set of buildings in the BAU and non-BAU cases, and we’re capturing specifically the policy-caused energy efficiency improvements. In the next step, we combine this change in energy use with the difference in fuel cost (disaggregated by fuel), which may be driven by other policies (such as a carbon tax or fuel taxes), most of which are handled on the Fuels page. This gives us a percentage change in cost to provide services to a given building area, disaggregated by component and by fuel type. We use an elasticity of new component energy demand with respect to energy cost to convert this into a percentage change in the energy efficiency of newly sold components. This percentage change is multiplied by the total energy use from the most recent prior calculation (“New Components Potential Energy Use after Quality Level Shifts”) to give the potential energy use after price-efficiency feedbacks. 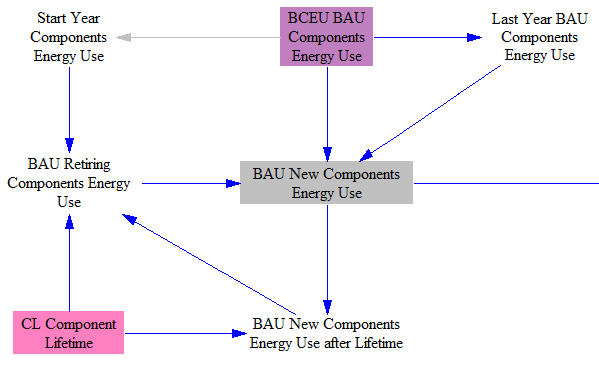 We add the difference between the newly sold components’ energy use and its BAU equivalent to the cumulative total. We retire these differences out of the cumulative total after one component lifetime (at which time, the components are replaced by still other components, which contribute their own differences to the cumulative total). As noted above (in the section on the accelerated retrofitting policy), Vensim doesn’t update level variables with the current year’s inflows and outflows- those affect the level variable during the following year. We don’t use that convention in the EPS. Rather, we want any delays to be instituted by the user using the policy implementation schedule, so we manually add the new and retiring cumulative changes to the “Last Year Cumulative Potential Energy Difference Relative to BAU” to get the current year’s potential energy difference relative to BAU. Finally, we consider building occupants’ behavioral responses to higher or lower energy prices. We first determine the change in cost of the fuel that would be needed to run all components at “potential” - that is, before the influence of behavioral response to prices. (This refers to changes in how buildings and appliances are used, not changes in what products are purchased. Price-based changes in what products are purchased are handled by a different section of this page, discussed above.) This is challenging, because the component electrification policy shifted a certain amount of energy use between fuel types (and our elasticities for building service demand with respect to energy cost are disaggregated by fuel type). If we simply compare the BAU and policy cases when the component electrification policy is enabled, it would appear that more electricity was required and less other fuels were required to provide the same services, when what actually happened is that the quantity of services provided by components that use each fuel type has changed. 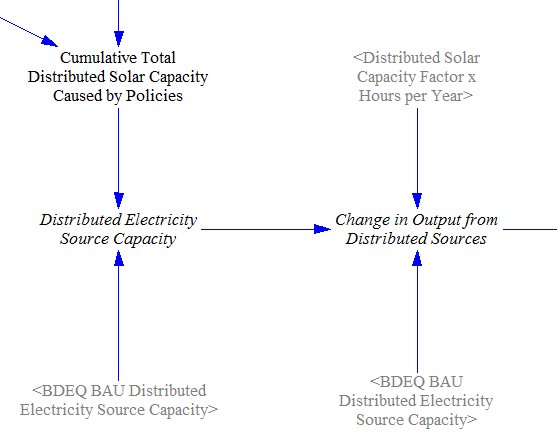 The simulator factors in the amount of distributed electricity generation capacity (from a variety of sources on-site at buildings), the vast majority of which comes from solar PV panels. 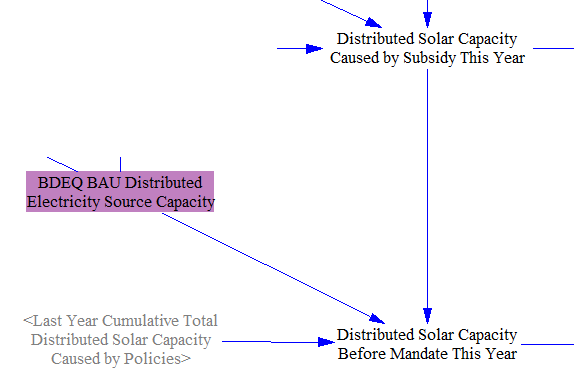 It also includes two policies that allow the user to increase the amount of distributed solar PV capacity beyond the BAU case. Next, we calculate the effects of the distributed solar carve-out policy. We multiply the total electricity demand (with a one-year delay to avoid circularity) by the minimum allowable fraction of electricity to come from distributed solar PV to find the quantity of distributed solar PV output we require in the current year. 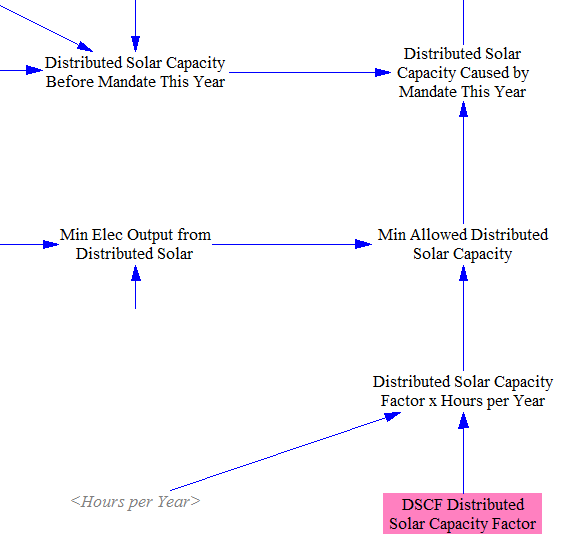 We convert this minimum output to capacity using a distributed solar capacity factor and find the minimum required distributed solar capacity. We subtract the amount of distributed solar capacity we already have this year (including the effects of the subsidy), and the remainder is the distributed solar capacity deployed due to the carve-out.